Public consultation: Tuesday 14 February, 11am to 4pm Earlsfield Library, 276 Magdalen Road, SW18 3NY. Online consultation is open from Monday 6 February to Sunday 19 February. Wandsworth Council are redesigning the existing junior playground in Swaby Gardens and would like your view. 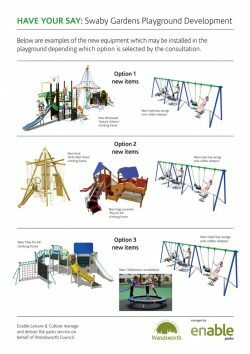 Up to £163,000 of funding has been secured from NCIL (Neighbourhood Community Infrastructure Levy) to refurbish the junior playground and move the toddler play equipment to be part of the new design. Wandsworth Council secures NCIL funding from development projects in the local areas and invests the funding in local community facilities. There are three designs to choose from, each aimed to improve movement and physical activity among children of all abilities. Come along to the public consultation meeting on Tuesday 14 February 11am to 4pm to talk to representatives from Enable Leisure and Culture and give your view in person, or have your say online here.